Before taking over Chevrolet, Dewar was GM's European sales boss. DETROIT -- Chevrolet's target as the value brand of a leaner General Motors Co. is to capture 60 percent to 65 percent of GM sales globally, Chevy boss Brent Dewar said last week. He said Chevy intends to double European sales to 1 million over an unspecified period, and he identified the United States, China and India as Chevrolet's best opportunities for growth. As GM shuts or sells its Pontiac, Saturn, Hummer and Saab brands and reduces the number of U.S. Chevrolet franchises by 1,000, surviving dealers are being asked to expand and upgrade stores to handle anticipated higher volumes in 2010 and 2011, Dewar said outside a regional dealer meeting in suburban Detroit. Chevy already generates more than 60 percent of GM's U.S. sales. 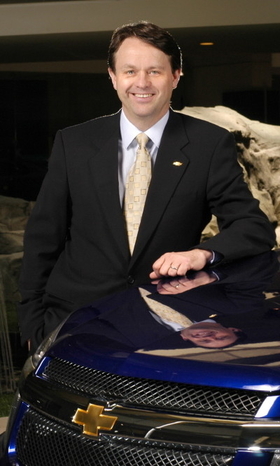 Dewar was GM's vice president of sales, marketing and aftersales in Europe before taking over Chevrolet this summer. Through six months Chevrolet sold 97,848 cars in Europe, down 5 percent from the same period last year, according to European automakers association ACEA. In Russia, Chevrolet's top European market, sales were down 53 percent to 67,955 units after seven month, data from the Association of European Businesses shows.